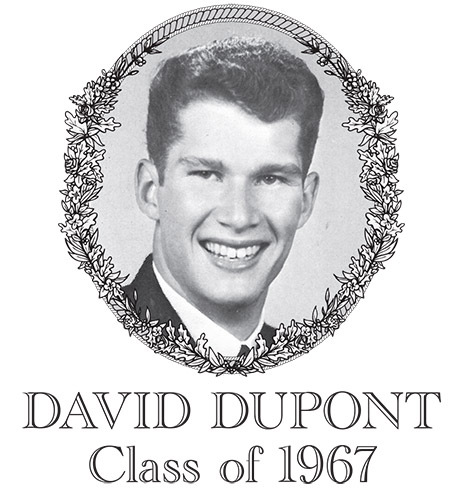 David DuPont, Class of 1967, was an exceptional basketball player at Bartlett High School, attaining membership in the elite 1,000 point scorers club over his three-year varsity career. David excelled on both sides of the ball, typically being assigned to defend the opponent's "big man" while also drawing the focus of the opposing defense due to his great jump shooting range. David's fierce passion for the sport revolutionized the way it was played in Webster and his attitude was infectious to the rest of the team. David utilized methods of training year-round that were not common to the sport of basketball for his era. David became the first sophomore to start on the varsity team in over ten years, starting alongside four senior players. He scored 181 points during this season. Following his sophomore year, Coach Martin Starosta said "Dave can shoot, drive, defend, and rebound. He should be the very best player in the county in his last two years." David emerged as a massive scoring threat during his junior year. While leading his team to a 17-8 record, David scored 458 points, averaging 18.3 points per game. As a Captain in his senior year, David continued his outstanding play, leading the team to a 16-8 record and scoring 442 points, averaging 18.4 points per game. This team also appeared in the District Tournament achieving one win. He also led the team to the Tri-Area Tournament championship game, with David being selected as a tournament all-star. Over his three varsity seasons, David amassed 1,081 career points. This total puts David in a club with the most elite basketball scorers of all time at Bartlett High School. David accomplished this feat before recognizing 1,000 point scorers became prevalent in high school basketball. David was selected as team MVP as a junior and senior and was also awarded the 1967 Exchange Club Good Sportsmanship Award. After graduation from Bartlett, David earned a Bachelor Degree from Tufts University. David had multiple strong finishes in the legendary Boston Marathon, was a volunteer EMT, and was a long-time Big Brother-Big Sister volunteer. David passed away in 2003. He predeceased his wife Judith who passed away in 2008 and leaves his son David DuPont, Jr.